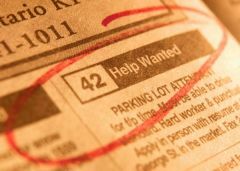 Looking for a spouse, or simply someone to date, can be a lot like looking for a job. And like the guys at bars who use lame pickup lines, having bad manners in the job hunt won't likely lead to what you want. Good networking skills are all about being sentient -- being finely sensitive to how other people perceive or feel things. And using those skills well can be the difference between landing the job or the date. While author Leil Lowndes doesn't directly make the same connection that I do between networking for a job or a date, her new book "How To Instantly Connect With Anyone" lists ways to build on business and social relationships, and "emotional prediction" of how someone is going to react is key in a job search, she told me in a telephone interview this week. "It's just very subtle things that just rub people the wrong way," Lowndes said of job seekers who likely won't get the upper hand when they don't correctly predict before they do something how the other person will take it. For example, taking someone's business card and quickly glancing at it and putting it in your back pocket is disrespectful, Lowndes said. Hold it with both hands and gaze at it as though it were a special gift for you. And when giving someone your business card, hand it to them horizontally at a high enough level so they can almost read it in your hands. The Japanese exchange business cards with respect, she said, carefully them handing them off and reading them before putting them away. Good manners should be a part of every job search if you wan to avoid the "stupidity glass ceiling," she said. "My jaw drops at how many people don't do these things," she said. One way to make an emotional prediction in a job interview that's conducted at the end of the business day is to acknowledge that you appreciate their time at the end of what may be a long work day, Lowndes suggests in her book. It puts them at ease and shows you empathize with how their day is going. To come across as dependable and competent, she suggests writing down instructions even if you have them memorized. Be sure to look up occasionally and look them in the eye, then go back to your notes. The boss will feel more secure about you, forming another connection. This is one reason why I bring a notepad to interviews, to take a few notes in case there's something I need to get back to them on. The book is made up of short "tricks," although they're more methods of communication and not really tricking anyone. They include how to develop an extraordinary gift of gab, enjoy parties, handle invitations, give personality and professionalism to your e-mails, making a big impression in the phone, and deepening relationships you already have. Employers make hires with their heart, Lowndes said, and getting in their heart by predicting their emotions can go a long way.